A bluff collapse near Seagrove Park temporarily halted train service Friday on a stretch of ocean-front rails in northern San Diego County. A roughly 55-foot-wide chunk of earth sloughed off a cliff near the foot of 14th Street in Del Mar about 12:15 a.m., city lifeguard Mike Emerson said. No injuries were reported. A number of people, including a surveyor who happened to be in the area, witnessed the collapse, and several videotaped it, Emerson said. 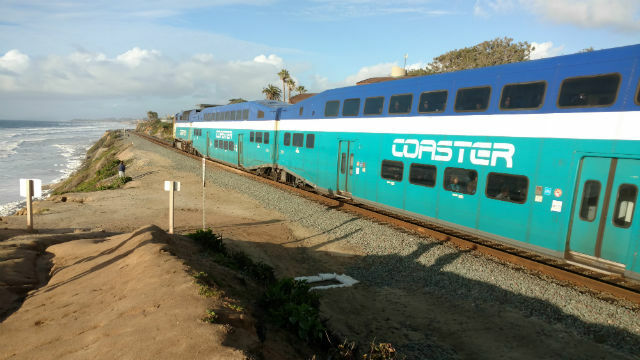 Due to the close proximity of train tracks in the area, North County Transit District officials suspended Coaster runs between Sorrento Valley and Solana Beach to allow for a safety inspection. Shortly after 2 p.m., NCTD announced that the passenger-train service had resumed in the affected area. Several other non-injury bluff collapses have occurred in the same general vicinity in recent months.